The campus of the Technical University of Denmark, known as DTU (Danmarks Tekniske Universitet), is located in Kongens Lyngby, about 10 km north of Copenhagen. Founded in the first half of the 19th century, DTU has been considered northern Europe’s best university for engineering since 2010 on the basis of reports by THE (Times Higher Education), an international research institute concerned with excellence in university studies. The university’s architecture contributed to this result, including the new Life Science Bioengineering B202 building by Danish architectural studios Christensen & Co. Architects and Rørbæk og Møller Architects. The key element in the project is a big foyer three floors high, the Biosphere, bringing together researchers from three different national Danish institutes, the National Institute of Aquatic Resources (DTU Aqua), the National Food Institute (DTU Food) and the National Veterinary Institute (DTU Vet). 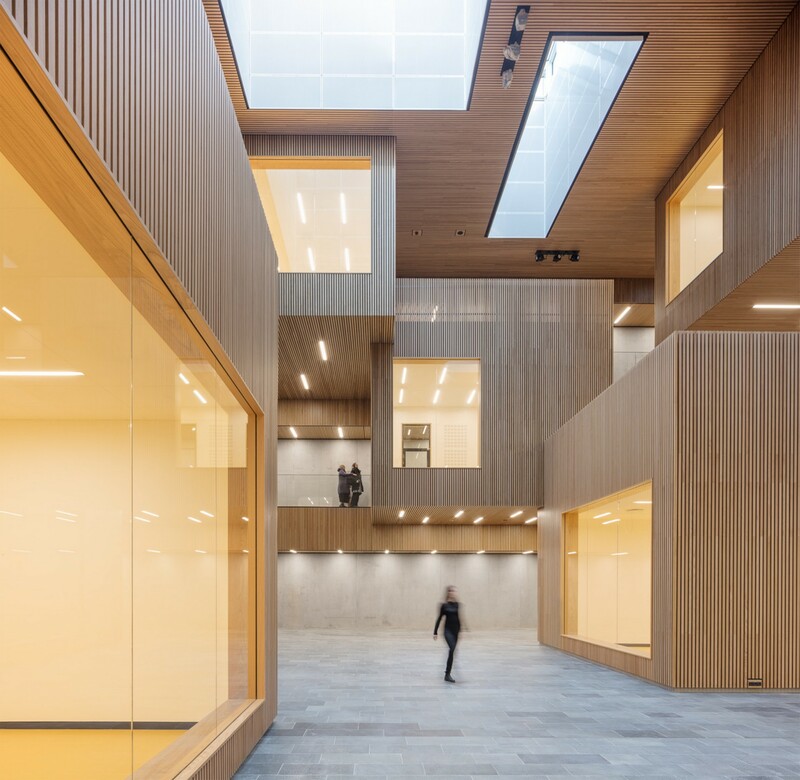 The new building by Christensen & Co. Architects and Rørbæk og Møller Architects is the most important and the biggest building constructed since the Technical University of Denmark campus was inaugurated in the ’60s. The architects demonstrate respect for the existing buildings even while substantially altering the original architecture. The building’s façade is covered with gold-coloured anodised aluminium panels, interrupted by niches and balconies, with black lacquered walls on the inside to add rhythm and give the complex a human scale. This structure is reflected in the building’s interior, in what the architects themselves call the biosphere, a warm wooden interior bringing together researchers from the three national research institutes. The golden hues of the building’s metal façade become warm oak planks lining the interior of the meeting rooms, which appear to float in space, flooded with daylight from the big skylights. The result is a dynamic space composed of simple, linear volumes offering users a number of informal meeting areas, as when the planks covering the meeting rooms continue beyond the ceiling to become the railings on the patios above them. The research centre’s architecture is itself an important tool for encouraging networking among researchers, as well as providing laboratories and other spaces serving a wide range of functions. The building also has special research facilities such as big salt water tanks and sophisticated installations including a cutting-edge ventilation system. The Life Science Bioengineering Building B202 has won a number of awards, including the recent DETAIL's Inside Special Prize 2018, awarded by the well-known German magazine for the interior design of the “biosphere”, which the judges call an important hub for the sharing of knowledge and for social interaction.